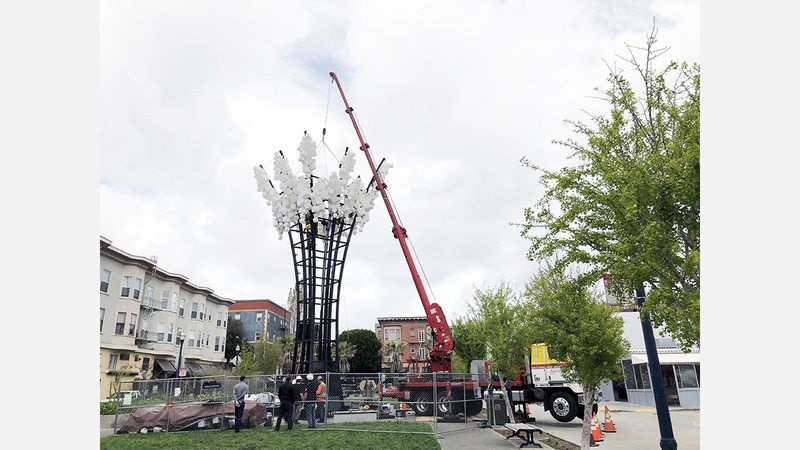 A 50-foot-tall tree-shaped artwork made of "steel and light" has been set up at Hayes Valley's Patricia's Green over the last couple of days, with an official opening party on May 5th. According to artist Charles Gadeken, the cubic form and fractal arrangement of 3D light pixels are supposed to represent the "evolution of organic matter and its amalgamation with digital technology." 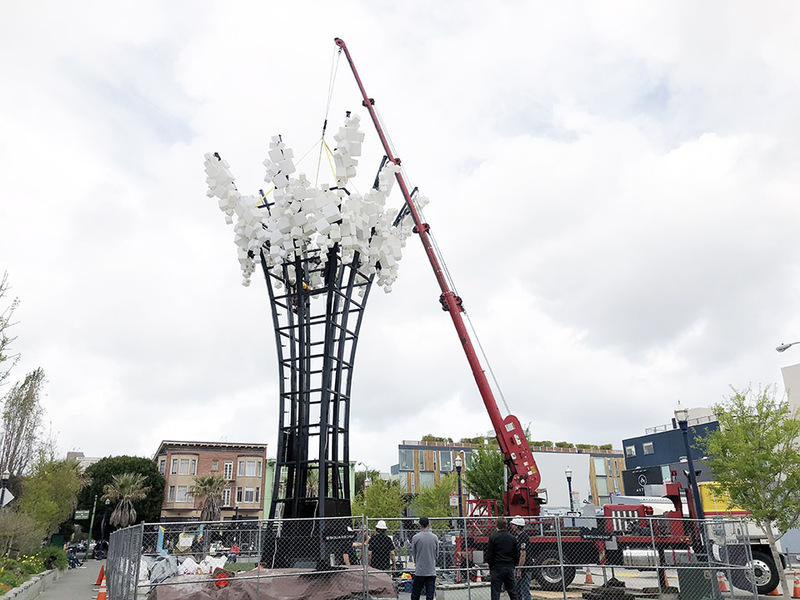 In all, the piece includes 786 white plastic cubes arrayed in fractal clusters. The sculpture was commissioned in 2014 by Coachella Valley Music and Arts Festival as 2SQUARED, and has also made an appearance at Burning Man in the same year. 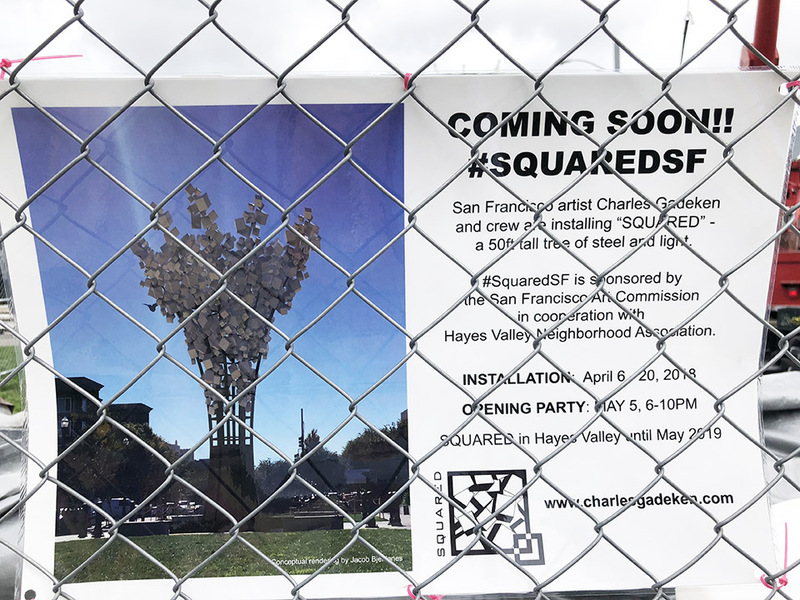 SQUARED will stay in Hayes Valley until May 2019 and was sponsored by the San Francisco Arts Commission. He said Patricia's Green is one of the few locations in the city that's suitable for large-scale temporary art installations. "I am so glad that I was able to bring my largest and most complex work," said Gadeken via email. SQUARED will run preset programs at night when the cubes are illuminated. There will also be an interactive controller that is, according to Gadeken, fun to play with. "We will have the interactivity for special neighborhood events and random times when I swing by the tree with friends," Gadeken said, adding that he'll post a calendar of special dates on his Instagram account. He said he wanted the artwork to be a spectacle, but at the same time, a place where people could gather and socialize. "We made sure to keep the benches on the base structure when we redesigned it," he said. The major challenge so far has been the tight space of the art plaza in Patricia's Green, said the artist. "We shortened the base support in collaboration with Erik Kneer of Holmes Structures engineering firm," but it still remained difficult to maneuver heavy equipment in a confined area. "We had to rent a taller boom lift than we've needed in the past and turned the tree 45 degrees to allow access all around," said Gadeken. During the installation, workers wre hit with heavy rain on multiple occasions. "This makes construction really difficult, especially with the electronics that run the LEDs," Gadeken said. For safety, everyone who needed to climb the tree wore harnesses. So far, Gadeken has relied on trained volunteers to install the artwork. "It is hard for people to come help during the regular work day, so we've been getting by with a skeleton crew," he said. Much of his preparation work was done at at Box Shop, his studio in Hunters Point. "I am beyond proud for the opportunity to exhibit my artwork in my hometown," said Gadeken. "It is a life goal achieved after a lot of hard work!"